There have been several poles of development: USA, Europe, and China are formatted in the world economy. How does the multipolar world economy influence the Russian region‘s development? How does the spatial structure of Russian economy develop under the multipolar world economy? The studies based on the main results of new economic geography and gravity theory concerning the spatial concentration of production, the core and periphery formation in the economy of countries and large regions. We propose the econometric model for the study and test of the spatial concentration factors in the Russian economy. We have researched the basic macro parameters of Russian regions‘ development: output, employment, investment, and population income. Main attention has been focused on the influence of multipolar structure of world economy on the Russian economy. One more significant factor in the research has become the consequences of the world financial crises. Results of estimation give proof to significant influence of world economic poles on spatial development of Russian economy. 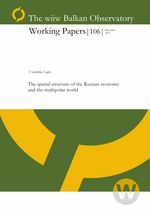 Small changes in the world economy can cause significant shock in economy of the Russian regions: industrial production, investment, and income. The eastern and western parts of the Russian Federation have different poles of gravity. They have different reaction to the changes in world economy poles. The economy of the European regions of the country is more influenced by economy of the European Union. Pressure of the Chinese and American economy on the eastern and western regions of Russia is similar according to the direction, but differs according to the strength of influence. Nevertheless, economy of China and economy of the USA more positively influence the economy of regions of the Russian Federation. Influence of geographical position of regions is proved by gravitational variables. The hypothesis about influence of expectations concerning development of the global economy poles on macro parameters of Russian regions has found evidence. In particularly, the hypothesis concerning negative expectations connecting with the economy of the European Union and the USA has confirmed. The world financial crisis has significantly affected the Russian economy.